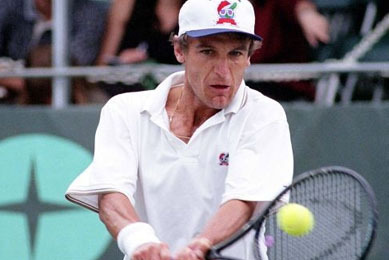 Tennis legend Mats Wilander will once again park his Winnebago at Desert Highlands to give residents another fast-paced, high-energy clinic on Saturday, March 23rd. It has been two years since the community played host to Wilander on Wheels (WOW) where Wilander goes to the people rather than make the people come to him. Wilander and fellow instructor Cameron Lickle have been driving across the country giving lessons and clinics to appreciative students for several years now. "Everyone commented that it was great to be on the court hitting with a seven time Grand Slam winner," said Desert Highlands Tennis Director Eric Anderson. For more information about WOW go to www.wilanderonwheels.com. In 2000, the U.S. Tennis and Track Builders Association named Desert Highlands winner of its Outstanding Tennis Facility Award. "With the grand slam surfaces of grass, clay, and hard courts, Desert Highlands is a tennis lover’s dream," says Anderson. NOTE: Desert Highlands will also host the next USTA Southwest Adult Slam Series event - the Grass Court Championships - in early June. This adult age group event (for players 35 & up) is one of the top four adult "surface" tournaments held each year in the Southwest. To find out more about that event, click HERE.